Introduction: Gena Philibert-Ortega is a genealogist and author of the book “From the Family Kitchen.” In this guest blog post, Gena writes about the women volunteers in the Salvation Army during WWI, the “lassies,” who served doughnuts to the American troops on the front lines. Do you have an ancestor that fought in World War I? As genealogists, the mention of that war brings to mind the World War I Draft Registration. Those draft registration cards provide some important clues for researchers, but one question I always have is: what was life like for our ancestors back in WWI? What was day-to-day life like for our soldiering ancestors? To invoke a much-used quote originated during the American Civil War, “war is hell.” During that hellish time in the trenches of WWI, however, there were groups trying to make soldiers’ lives a little less difficult. For those Americans who served on the front lines in France, one good experience of the war might have had nothing at all to do with warfare. It was something that, during a time of great distress, brought back fond remembrances of home. That memory involved doughnuts. Yes, doughnuts and the young women who served them during WWI, volunteering their time with the Salvation Army. It’s not uncommon during wartime for various organizations to step up and provide services to U.S. soldiers. During World War I, the Salvation Army sent approximately 500 volunteers to Europe who helped with everything from teaching Bible classes to playing music, providing meeting space for religious services, and cooking and serving food. These men and women followed the soldiers to the battle front and were often in danger as they served. In their 1919 book The War Romance of the Salvation Army (available on Google Books), Evangeline Booth and Grace Livingston Hill write about the World War I activities of the Salvation Army. 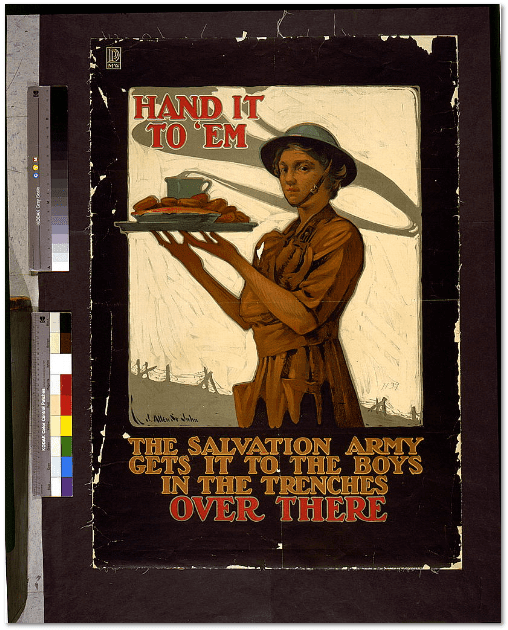 They describe how the women of the Salvation Army began providing doughnuts to soldiers on the front lines. The story is told that the Salvation Army was serving a group of soldiers in Montiers, France. The Salvation Army women volunteers, referred to as “lassies,” noticed the low morale of the men as they endured the endless rain and hard training. The women believed that some home cooking would boost morale. After various suggestions, it was decided that doughnuts would do the trick. That first experiment yielded 150 doughnuts for 800 U.S. soldiers waiting in line. One soldier who had a doughnut that day is said to have exclaimed “Gee! 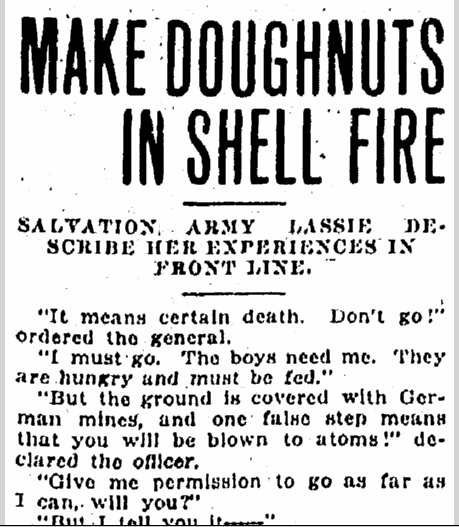 If this is war, let it continue!” While doughnuts probably were a welcome respite to the men fighting in World War I, my guess is that the fact they were cooked and served by young women probably helped sweeten the deal. A nameless, older Salvation Army worker is quoted as reminiscing that “…it wasn’t the doughnut at all that made the Salvation Army famous, but the wonderful girls that the Salvation Army brought over there; the girls that lay awake at night after a long hard day’s work scheming to make the way of the doughboy easier…” (page 77). Serving doughnuts and coffee was dangerous work for these women, who had all volunteered to go overseas and serve—as described in this 1919 WWI newspaper article. This June marks the 75th Annual National Doughnut Day. Interested in making some Salvation Army doughnuts? 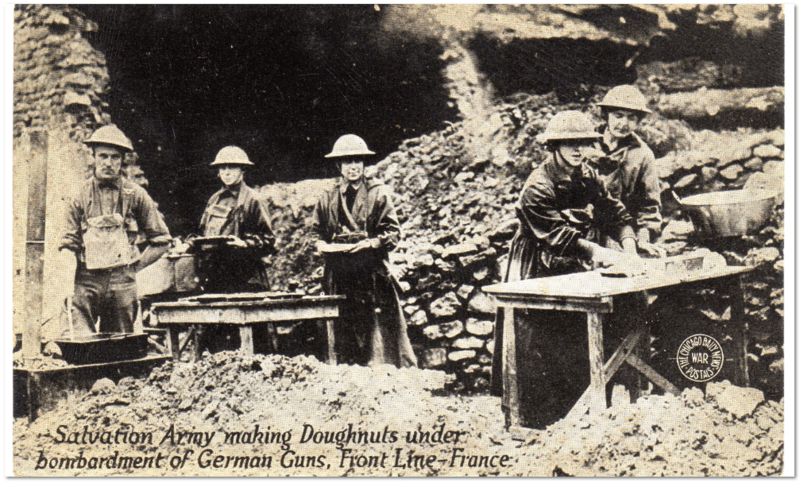 The Salvation Army blog, Doing the Most Good, provides a recipe of the doughnuts made for soldiers in both world wars. 9 More Recent Newspaper Obituary Collections Coming Soon! My dad served in WW1 and in his later years told me that the war was so bad that the soldiers made a pact not to talk about it because they did not think that they would be believed. He did not sleep in a bed the whole time he was overseas and he walked all over France. How lucky you are to have had him tell you a little bit about his service. Those family stories are so important to record and hand down to future generations.